It can be everywhere, can’t it? I should know, I live in a home with 10 people! Even when our house is “clean” it still feels cluttered. The thing about clutter is this. Clutter can make our minds tired. Being surrounded by clutter can make us feel like we are paralyzed to get anything done. Cutter lowers our sense of self esteem. And I don’t know about you, but clutter can even rob me of my feelings of hope about the future. For this reason, tackling clutter is one of the most important things you can do every day. And, clutter is something that can quickly become out of control if it’s not being taken care of every day. In all reality, clutter can be our worst enemy. So, it’s become one the areas that I have focused on implementing all kinds of systems, tips, and tricks over the years. Even better, I have an amazing tool about clutter all prepared for you. It’s s free room by room strategy guide, and you can enter your email below to have it delivered right to your inbox. Then, you’ll get more done in less time! Enter your email to grab your checklist and some pretty cool stuff too! Success! Now check your email to grab your download and learn what to do next! Sometimes the hardest part about clutter is just knowing where to start. If only we could just get started, it may not take that much to keep the ball rolling. 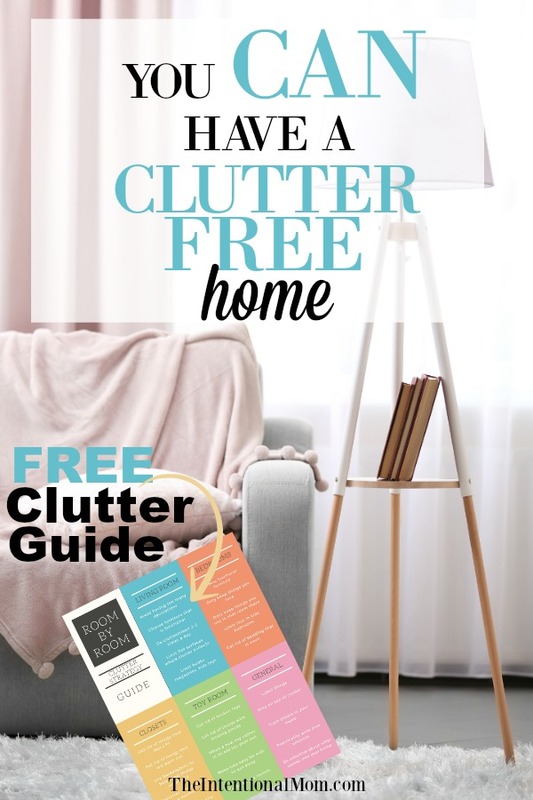 Here’s how get that ball rolling to get on top of your clutter organization so you can have a clutter free home! Pick a small area and a small clutter project to get started with. This will give you something to feel accomplished about right from the start. Tackling one project makes you ready to take on the next project. Do you like to work on a small area from top to bottom? Maybe you like to work from one pile to the next. Or, maybe you like to work on one thing to declutter at a time. For instance, if you are choosing to tackle the clutter in your closet, maybe you would want to start with taking care of the dirty laundry first. This is an example of one thing to work on in your area of decluttering. Set an amount of time to spend on this decluttering area or project. Knowing where the end is makes any project more tolerable. You could choose to work on decluttering your closet for 30 minutes. Then, at the end of the 30 minutes you are done whether you are actually done or not. You can always come back to work on it again. If you have decided on 30 minutes, you have my permission to be done after 30 minutes. Decide on a small reward or treat for when you are done. But, you only get that reward if you complete your plan of attack to the best of your ability. Kids work good with a reward attached at the end, I bet you will too! I love racing the clock, and I have yet to meet a kid or adult who doesn’t work just a bit quicker when they are racing a timer. Try it – I think you’ll love it! You don’t have to settle with being overwhelmed by clutter. You can get started on making your way to a clutter free home with this organized plan of attack. Download my free guide to get it done in less time.